You'll be £12.99 closer to your next £10.00 credit when you purchase A Wargamer's Guide to 1066 and the Norman Conquest. What's this? This is one of the first titles in an exciting new series of guides for wargamers. Taking one of the most pivotal and famous episodes in British military history, it gives a wargamers perspective of the dramatic events of 1066 and the Norman conquest upto around 1070, and advice on how to recreate these on the gaming table. Advice is given on factors to consider when choosing an appropriate set of commercially available rules, or devising your own, to best suit the scale and style of battle you want and capture the flavour of the period. The relevant ranges of figures and terrain pieces and buildings are also reviewed. Analysis of the forces involved, organization, tactics and strategies will help with building your armies and there are interesting scenarios included. Whether this is a new period for you, or you are looking to refresh your existing interest in the period, this handy guide is sure to hold much if interest for you. This book covers one of the most famous campaigns in English military history. It provides an overview of events and analyses the forces involved - their organisation, weapons and tactics. It guides the wargamer on choices of figures and provides both historical and generic scenarios for further exploration. This is a first class book for war gamers, offering both background and ample information on ‘how to go about it’. Most highly recommended. I was kindly offered a copy for review by Pen and Sword. This book is part of a new wargaming series by Pen and Sword, the well-established military history publishers. The book is written by Daniel Mersey, an established wargaming author. It aims to be a guide to wargaming one of the most famous battles of all time, the Battle of Hastings (1066) and the associated campaigns. The book certainly achieves that aim. The author has assembled large amounts of information into a single book. As it says on the cover, it clearly covers the background to the campaign, the armies, the potential rules to use etc… I was particularly pleased to see the coverage of the wider campaign of the Norman Conquest, rather than just focussing on the single climatic battle on the south coast. 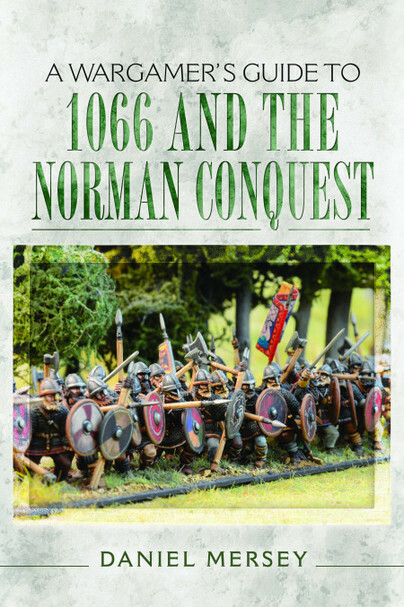 Dan has also penned A Wargamer's Guide to 1066 and The Norman Conquest, an era that readers will recognise as much more familiar territory for him. The broad, introductory brief for the work is the same as for the Zulu Wars title and, taken together - and clearly with many more to follow - I can see this building into an excellent range of reference works for wargamers over the coming years. Well done Pen & Sword!